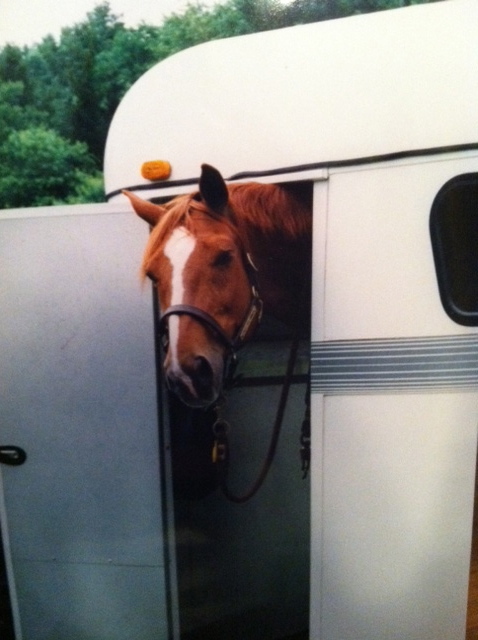 The very last horse I ever owned was a beautiful, giant chestnut who had spent too much time in the show ring. We worked out a very good deal: I agreed not to show very much, and to spend the majority of our time together outside in the fresh air. He agreed not to try to kill me. Everybody wound up happy. The only flaw in this contract was that Cen hadn’t actually spent a lot of time outside. At first, it didn’t matter. He was kind of miserable and just plodded along with his head down. Then one day, around the third or fourth month he’d been with me, he picked his head up, looked around, and essentially went “HOLY $#!T! Look at all these giant scary things!” and put it in reverse. This was a problem on oh so many levels, starting with the fact that the scary things were trees, and sometimes rocks, and that we lived in New England where trees and rocks are prevalent. The going in reverse wasn’t so much fun either. And of course, I made it worse: We’d be bopping along, having a fine ride, and then a very large odd-shaped tree would appear on the trail bend. Since I was frantically scanning the horizon for just such a tree, I’d see it before Cen and tense up. He’d feel me tense up, look around and see the tree, and be all “WHOA! That’s a big tree! Obviously it’s making her nervous — now I’m terrified! Let’s get out of here!” It was clear a new strategy was called for. My instructor made me reread my Sally Swift. Sally, for those of you who don’t do horses, was an amazing woman who taught riding for decades, and rode until she was a very old woman. She came up with a theory called Centered Riding. One of the tenants of Centered Riding is Soft Eyes. It’s hard to explain without too much detail, but basically, instead of staring at an object (such as the tree that is terrifying you) you relax your field of vision, encompassing not just the object, but everything around it. You are still aware of it, but your awareness has expanded, and has put the object in perspective. This relaxed viewing changes everything, including your breathing. When I started using Soft Eyes again, oftentimes Cen never even noticed the horse-eating tree or rock — since my breathing and tenseness hadn’t alerted him that there was a problem — and we were able to slide right by it. Eventually, we slid by so many of them that they were no longer scary, and he turned his attention to other threats, such as the stalking barn cats and the deer that used to love to crash out of the woods at us. But trees and rocks? No problem. Are those trees I see? I bring all of this up not just because I like to remember Cen and those days, but because I think Soft Eyes has writing applications, too. Too often, when there’s a problem with our story, we try to beat it into submission, forcing the plot, making the characters behave a certain way. Instead, I’m practicing Soft Eyes this week. I know there’s something I need to improve in my story, but instead of letting the problem be the center of attention, I’m going to relegate it to the outskirts. I can still see it there, hanging about, in my peripheral writing vision, but it’s not scaring me anymore. It’s not making me tense. And with my attention focused on writing, not on fixing, I’m pretty sure the issue will resolve on its own. How about you? Can Soft Eyes make a difference in your writing? I LOVE the soft eyes analogy, Liz! For two reasons, actually. I grew up in a riding family, but never really rode much myself. But I wrote a trilogy loaded up with skilled equestrians (particularly a group of women. In fact, I have a female character who rides a chestnut with a white blaze – mare, though. Her name’s Starfire – the horse, I mean 😉 ). The more I can absorb about their skill, the better. Second, I sort of found my way to this techinque myself, but hadn’t labeled it or analyzed it too closely. In this last rewrite of my book one, I had taken on such a bewildering amount of input, it sort of froze me up. I hired Cathy Yardley from WU as a crit-editor, and she supplied even more. When we spoke on the phone before I started, she advised me to focus on my characters’ goals, then just ‘be aware’ of all the rest – that it would flow into my rewritten scenes. After that it was just a matter of focusing on the story mechanics, ramping up the pivotal scenes. My gut tells me it was a soft eyes approach, and that it worked… at least I hope so. We’ll see. It’s out to betas again, so fingers crossed. Great post. You’re my new equestrian resource. 🙂 Thanks, too, for your support over at RU and on Heather’s blog. I really appreciate it. I love that you are writing about equestrians, Vaughn. And I’m glad you’ve stumbled across the concept of soft eyes, too. I hope it helps — my fingers and toes are crossed for you! And I’m happy to answer horse questions anytime! I love horses too. I’ve never owned them, to my great regret, but grew up riding them and they are in my murder mystery, owned by the MC. One of them comes to her rescue in a small, but significant way in the end. I’m glad Cen found you. What happened to him? Hi Deborah! Your mystery sounds wonderful – just what I’d like. Cen and I had a run of good years together — he was that once in a lifetime horse. He foundered when he was 24, possibly because of a pre-existing condition. We kept him going for six months, but he was in a lot of pain and the vet finally suggested we put him to sleep. That was four years ago but I still miss him, and I think the fact that no other horse could come close to him is one reason I stopped riding.